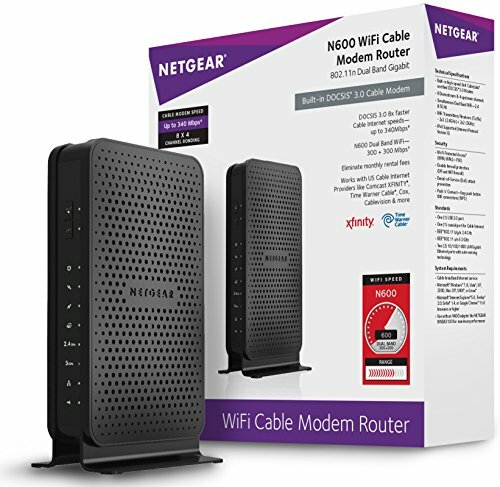 The Netgear C3700 (aka C3700-100NAS, C3700v2) Wi-Fi cable modem router certified for most cable service providers is the fast version of the C3000 model. This model comes with dual-band N600 Wi-Fi for speeds up to 600Mbps as the dual band reduces Wi-Fi interference and doubles bandwidth and comes with the secure WPS connect button and WPA/WPA2 security. The C3700 is a reliable modem plus router with high ratings that provides high speeds making it more ideal for more than just casual internet usage.